In the middle jurassic, 165 million years ago, central China was a lowland river plain. 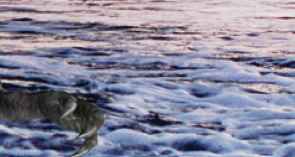 The region was prone to flooding, and many dinosaurs drowned in the rising waters. Their bodies were washed downriver, where they collected at river bends before slowly sinking in tangled groups into muddy sediments. Over time, the rivers disappeared, leaving deposits behind that set into the sandstones and mudstones of Sichuan Province. In 1972, at Dashanpu, an enormous bone bed of dinosaur fossils was discovered. More than 8,000 bones have been excavated, revealing sauropods such as the incredibly long-necked Mamenchisaurus, the small ankylosaur Huayangosaurus, and the carnivore Gasosaurus. 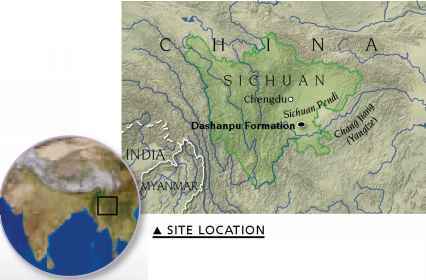 The Dashanpu Dinosaur Quarry is in central Sichuan Province, southwest China. Part of the site now houses the Zigong Dinosaur Museum, which displays China's best collection of dinosaur fossils. Until more material is found of Gasosaurus, it remains a mysterious dinosaur. Only parts of a single animal are known—an arm, a pelvis, and a leg. Paleontologists have suggested that it may have been a carnivore. Some recently named dinosaurs have been given unusual names that have nothing to do with their appearance or lifestyle. Gasosaurus is one of them. It was described in 1985, and in honor of the Chinese gas-mining company that discovered the fossil quarry at Dashanpu, it was named "gas lizard." In this exhibit, a Shunosaurus skeleton has been mounted as if it is reaching up to strip leaves from trees. It had a precision bite, and as its jaws closed its teeth rubbed against each other. This slow-moving plant-eater had a bulky body with a long neck and tail. 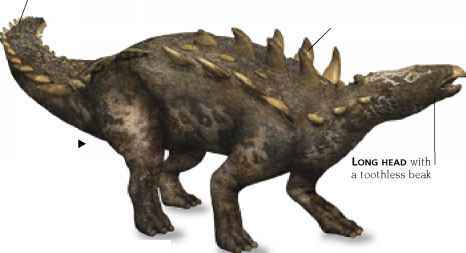 Unlike other sauropods, Shunosaurus was armed with a bony tail club that had two spikes. This would have been an effective weapon against a predator.